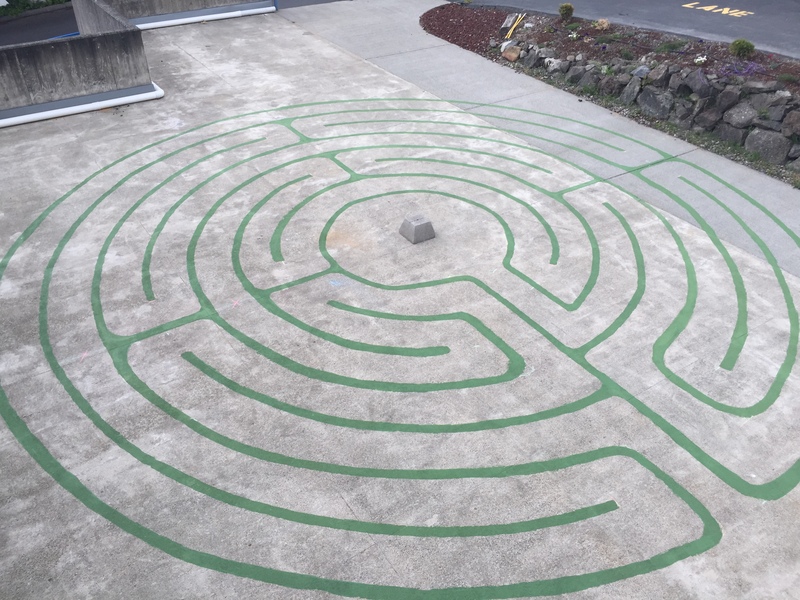 The permanent labyrinth is now open, located on the upper west patio of the Christian Center. Our Christian life can be described as a journey with God, bringing us ever closer in our relationship with God and with others. 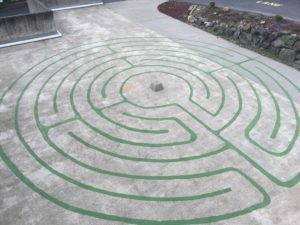 A prayer walk labyrinth provides a metaphor model of our Christian life journey as we face many turns we did not expect in our search for a quiet center. Some gently curving sections of the prayer walk allow us to move easily and quickly; others slow us down and catch our attention as they turn us abruptly in the opposite direction. The path may begin by leading us deceptively toward the center, only to circle around it and then move away. We may meet others on the way that we can follow or lead. We may need to step aside as someone with more confidence or experience moves quickly past us or we may simply be on a more contemplative walk, confident of where we are going but walking slowly to maximize the experience. On reaching the center of the prayer labyrinth, we can rest, pray, or experience a new meaning to “being centered”. Does this sound interesting, yet familiar to you? We encourage you to experience it. There is no right or wrong way to walk this prayer labyrinth. The only rules are to respect the prayer walk and others who are there. Simply begin, focusing on a quiet mind and open heart that allows God to accompany you. The following are some simple suggestions that will assist you in maximizing the experience. Stand at the entrance. Be aware of your breathing. Shed any fears or expectations of what the walk may bring. Follow the pathway to the center. When you reach the center, you may want to pause and experience God’s presence and/or offer a prayer. Each person can establish the timing for walking the prayer path. You may need to step aside and allow someone walking more quickly to pass or you may quietly and carefully pass another person. The Journey In: as you open your mind to spend this time in the presence of God. The Journey Out: that allows you to reflect and gradually return to your daily world. Listening for God’s voice or message to you. Quiet your mind, focusing on God and the walk. Finish your walk with prayer. Releasing Worries and Cares. As you Journey In, lay down a worry or care with each step, remembering that Christ said, “Come to me all who are heavy-laden and I will give you rest.” At the Center, thank God for the peace resulting from the walk in and pray for continued peace as you journey out. Confession, Repentance and Forgiveness. Ask God to be with you, Journey In with reflection and confession. At the Center, ask God for guidance and direction for the future. Journey Out listening for God’s voice and giving thanks for his presence. Discovering Your Vocation or Calling. As you Journey In, listen for God’s message to you, asking for his support. At the Center, concentrate on the gifts and talents he has given you. As you Journey Out, pray for guidance and strength to equip and sustain you in His service. A Walk of Thanksgiving and Gratitude. As you Journey In, with each step think of something for which you are thankful. In the Center, stop and thank God for the people and blessings you remember. On the Journey Out, experience the joy of those remembered blessings and the people of God who have been part of each blessing. A Walk of Remembrance. As you Journey In, remember the person or event you are focusing on; the joys and special times you shared. If it’s an event, feel the joy of experiencing that special time and the people who helped make it such a blessing. In the Center, thank God for this person or event that has made your life special. On the Journey Out, open your mind and heart to people and/or events that currently add meaning to your life.